Heat oven to 350°F. Grease and flour 8x4-inch loaf pan; set aside. Combine sugar, 1/2 cup Cinnamon Sugar Butter Spread and eggs in large bowl. Beat at medium speed, scraping bowl often, until creamy. Reduce speed to low; add bananas and vanilla. Beat until well mixed. Stir in all remaining ingredients until just mixed. Spoon batter into prepared pan. Bake for 55 to 65 minutes or until toothpick inserted in center comes out clean. Cool in pan 10 minutes; remove from pan to wire cooling rack. Cool completely. Serve with additional Cinnamon Sugar Butter Spread, if desired. 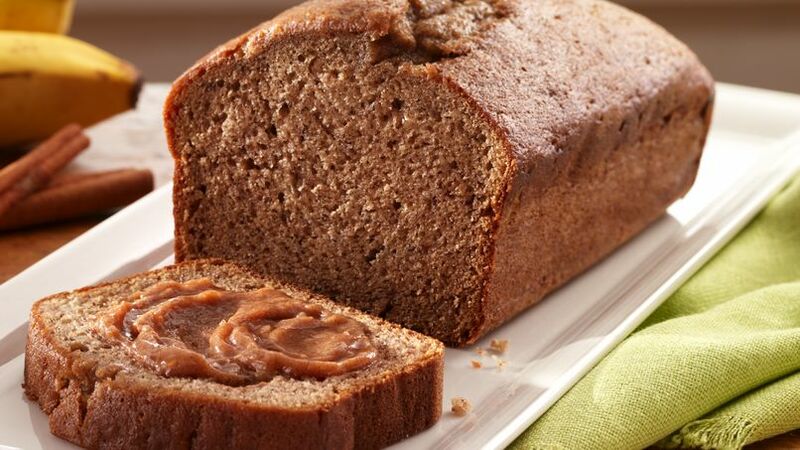 Everyone’s favorite—banana bread is made even more delicious with the taste of cinnamon.